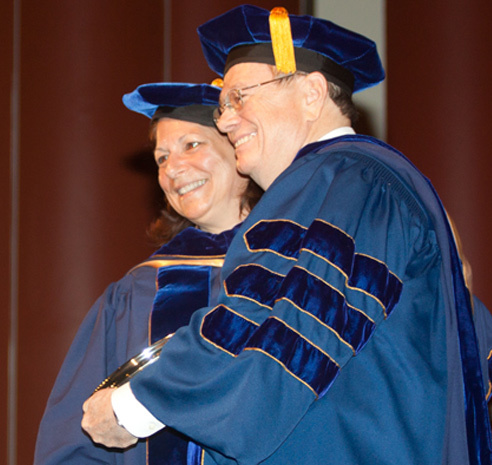 Charles M. Love, III (left) receives the Justitia Officium Award from Joyce E. McConnell, Dean of the West Virginia University College of Law. Charles M. Love, III was presented with the prestigious Justitia Officium Award at the West Virginia University College of Law Hooding and Commencement Ceremony on Saturday, May 14, 2011. Mr. Love is a partner in the Charleston, West Virginia office of Bowles Rice McDavid Graff & Love, LLP. He joined the firm in 1969 and is a leader in the firm’s litigation department. The WVU College of Law established the Justitia Officium Award in 1978 to recognize outstanding contributions and service to the legal profession. It is the highest honor the College of Law bestows upon an individual and is presented annually. A bronze plaque, bearing Mr. Love’s name and the year the award was presented, will be mounted in the lobby of the WVU Law Center. Mr. Love earned his bachelor’s degree in 1962 and his law degree in 1965, both from West Virginia University. He is a past president of both the West Virginia State Bar and the West Virginia Bar Association and a permanent member of the Fourth Judicial Conference. He has served as chairman and chief executive officer of the West Virginia Housing Development Fund (1981 to 2003) and was a member and officer of the Board of Trustees of Thomas Memorial Hospital. He is a Fellow of the American Bar Association, a Fellow of the West Virginia State Bar and a member of the Executive Council of the West Virginia Bar Association.